During the 1930’s, one man named Yokotta, was instrumental in promoting the interests of the San Francisco Go Club to a very considerable extent. In fact, he is one of the principle benefactors in the club’s history. Mr. Yokotta was postmaster of the Japanese ship, “Assama Maru,” traveling between Yokohama and San Francisco. He was an avid Go player, about shodan in strength, and whenever he came to San Francisco he would stop by the Go club for a few days before his ship returned to Japan. At the club he made many friends and was so impressed with the members’ Go spirit that he felt determined to use his influence with the still embryonic Nihon Ki-in to establish the San Francisco Go Club as an overseas chapter. At that time, this was a very unusual idea. The Nihon Ki-in was a strictly national organization and had no overseas contacts at all. 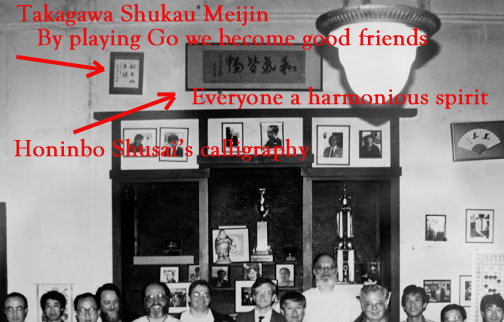 Nevertheless, Mr. Yokotta convinced the right people to look beyond the national level, and on October 1st, 1936, the San Francisco Go Club became the first overseas branch of the Nihon Ki-in (see image above). At that time the club was given the name “Nihon Ki-in Soko Shibu” (Japan Go Association San Francisco Branch). 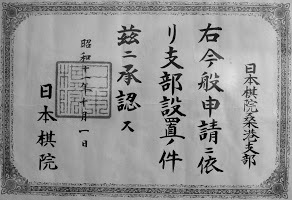 Meijin Honinbo Shusai the 21st, the last hereditary master of the house of Honinbo (about whom the “Master of Go” was written), on hearing the news was so pleased that a gave a large-scale commemorative example of his masterful calligraphy (see image below) as a present for the new branch, as inspiration. Mr. Yokotta brought both the branch charter and the calligraphy on his next trip to San Francisco, where they were framed and are still preserved. 1961 channel 5 TV Video of the SF Go Club (1881 Bush Street) – The opening scene is Mr. Torao Moriguchi 4 Dan hammering a small paper sign ‘Go Club’, under the Japanese sign “Nihon Kiin Soku Shibu” (Nihon Kiin San Francisco Branch). The SF Go club teams up to spread Go at the Cherry Blossom Festival. We also celebrate the life of our closing Go club at 500 8th Ave in the Inner Richmond district. Most of these photos were taken at the old club at 1881 Bush Street, probably in the 70’s. I suspect Lloyd Gowen was the photographer for many of the older pictures. The more recent pictures (below) were taken by Ernest Brown and Paul Goodman. I (P.G.) scanned some from old prints, others from contact sheets. Some I photographed directly from the wall pictures at the current club (and so you might detect an unavoidable glare from the reflection of light off the glass frames.) You can always see the pristine originals if you come by the club. If you register for a free Google account you can post comments after you click on a picture. Everyone who then clicks on the picture can view your comments. It would be very helpful if you could name various people in the pictures, and even better if you could recount some true recollections about the events and people you see. On Sunday July 18th, 2010, California State Senator Leland Yee (Assistant President pro Tempore) came to the San Francisco Go Club to present Jiang Ming Jiu, 7-Dan with a Certificate of Recognition from the California State Senate in honor of the Ing Chang-Ki Goe Foundation and their continued sponsorship of the World Youth Goe Championship. This year’s contestants are both students of Jiang Ming Jiu and he will accompany them to Peng Hu, China for the tournament along with Paul Barchilon. There he will present the Certificate to Ing Ming Hao and Yang Yu Chia of the Ing Foundation at the opening ceremonies of the tournament. Please notify info@sfgoclub.com if you would prefer not to have your image displayed on this public space.